First Responder Ronnie Spencer has a no-dating-firefighters rule. She lost her father to a fire, and won't risk the heartbreak of losing someone else. But when Steve McNeal returns, Ronnie’s heart is tested. How can she swear-off dating a firefighter when she has to work with the one man she used to love? When the unthinkable happens, Ronnie has doubts. How can a loving God allow tragedy to stalk her life again? As her faith wavers, Ronnie must decide. 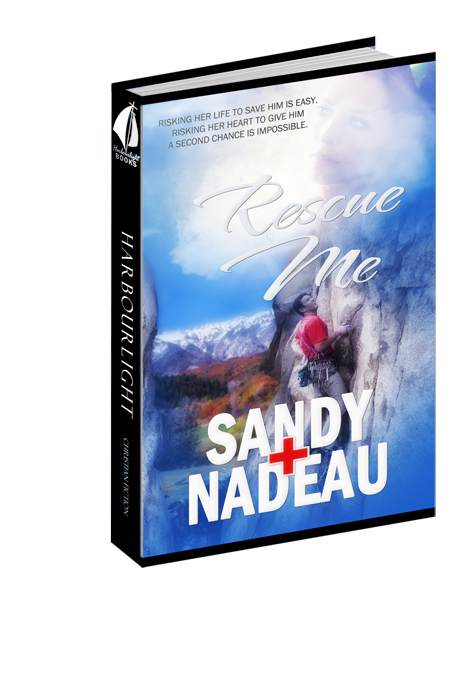 Will their blossoming relationship be quickly extinguished by the very thing she feared, or will Ronnie trust God and allow her heart to be rescued--even if that means giving it to a firefighter? “I can’t believe this.” Steve McNeal reached down again to try to move the rock that trapped his foot. Pain shot through his entire leg and cold dots of perspiration chilled his forehead. He rested against the granite boulder trying to ignore his throbbing ankle and to slow his heartbeat. Of course this had to happen. How could he have been so stupid as to try to scramble between the boulders alone? How many times had he scaled this boulder field? A shortcut to the trail. Brilliant idea. Breath expelled out of him, inflating his left cheek. Repositioning his upper body to find any level of comfort, he closed his eyes to see the image of her in his mind. He missed Ronnie since she broke it off a few years ago, but this would not be the way to encourage her back into a relationship. He knew the drill. He was a firefighter, for crying out loud. He had given the talk to countless grade-schoolers. Never hike alone. Stick with a buddy. Sheesh. How humiliating. He’d never live this down. The heavy scent of fresh pine and forest debris filled his nostrils. A chipmunk skittered down below, free as could be. “Show off.” Irritation rose up inside and increased as he took it out on the wildlife. “You’re losing it, Steve.” He roared against the pain developing in his stuck lower leg, reminding him of the guy who had to cut his own arm off. He, too, had been out alone, and after days of a rock trapping his arm, with no help in sight, the man had no choice but to amputate his own arm to make it out alive. The pain started to bring on desperate thoughts of how to escape this mess he’d gotten himself into. “Maybe…” He looked down at his leg. No, Ronnie would still know what a stupid thing he did. Even more stupid if he cut his own leg off. They’d get him some help, right? He hoped they realized this was serious. With little else to do, the thought wouldn’t leave him. Amputation would make his job as a firefighter a bit difficult. He resigned himself to wait. Wait for her to come to his rescue. He groaned. Maybe she would have today off. Ah, one could hope. Again he pulled his leg and tried to reposition or better yet, wrench it free, but it put his ankle that much closer to breaking. He had to refocus and began to analyze the position of his foot. He had his forearms wedged against the rough granite in a desperate attempt to try to keep his weight from causing further damage to the tendons in his foot. It continued to scrape his arms raw. Someone—a skinny someone—would have to raise the rock from below to free his foot. A skinny person could fit in the gap beneath him between the two boulders, and he knew who that would end up being. He couldn’t see any other way, outside of an earthquake shaking it loose. Voices echoed up to him from the path through the forest. How am I ever going to live this down? He moaned as his head fell backward, seeing only sky. The team came up the trail toward the rocks. Finally. Pine needles crunching, gravel sliding as they rushed to reach his self-inflicted prison. The young eyes he’d seen looking over the top of the rocks and the woman who resembled the boy pointed toward him. As all the faces looked up, he saw her. He knew it. She would have to be on when something like this happened. And Troy, the obnoxious rookie on the fire department. Great. Of course, they both had to be on call. Ronnie’s forehead scrunched, her eyes filled with…was that concern? “Steve. What in the world…?” She dropped her gear and came near the base of the rocks to evaluate his situation. The team of rescue and fire department personnel followed her up the slope as close to the rock face as they could and set their gear down. The team leader, George, walked over to the narrow opening under Steve and examined the situation. Troy took Ronnie’s arm to lead her up to the gap. Ronnie gave him a scowl and pulled her arm away then worked her way into the area on her own. She tightened the chin strap of her climbing helmet as she worked her way into the cavity and climbed on some of the long, fallen rocks, testing their stability. She looked up and smiled. Did she have to be so cute? “How long have you been up here?” She continued to maneuver, bracing her backside against the granite. Her helmet bumped and scraped against the stone. She got under the rock. “More than an hour. I came out early to hike and decided to take the rocks for a better work out. I slipped. Then that blasted rock fell and wedged me in. I couldn’t pull out of the way in time as I slid down.” He pushed against the rock wall with his right forearm and grimaced. His heart warmed at her concerned expression, remembering how close they had come to being married. “I think it’s a bad sprain at this point, my hiking boot is helping, but much longer and I think my ankle might snap. The pain’s increasing.” Steve’s face hurt from frowning. “Once they get the harness down to you, I’ll push the rock while you try to pull your foot free if you can handle the pain. If this doesn’t work, we’ll have to get the saw or else the explosives.” She gave him a lopsided grin. The straps slid against his back, allowing Steve to slip his arms into the loops. He cringed as he had to take an arm away from the wall of rock and pushed with his free leg for support. He pulled the straps around his thighs and buckled them. Each movement had to be quick so he wouldn’t put prolonged pressure on the strained bones. It hurt so bad he didn’t dare stress it more than necessary. Who would have thought he’d be on this side of a rescue? He fumbled with the fastener and attached the two loops at his chest. “All right, let’s get on with this.” His lips pressed tight against each other, his jaw clenched so hard his teeth hurt, knowing he was in for some intense pain as Ronnie freed his foot. Ronnie had done a good job of avoiding Steve the last few years. Oh, it was inevitable that they’d be on some calls together. But did she have to be the one to rescue him? She straightened her shoulders to steel herself against the emotions of the past. She had to be professional. Forget that she had fallen in love with him until…she choked back the thought. “We’re getting there Steve, keep trying.” She continued to apply force. He let out a determined yell. The rock raised as his foot escaped and then settled back among the fallen stones. She kept her hand against the cold surface. Steve held the foot out away from the rocks, the harness holding his weight. His face was scrunched in obvious pain. Ronnie backed out of the gap. Troy pushed his way in. “Let me get under him, Veronica. I want to be the one to help him out of this mess.” Troy laughed. Steve made the effort to keep his leg raised and used the other foot and his arms to keep from banging into the rocks. The men above lowered him slowly. Troy guided and pulled Steve away from the rock face. George began to work at the laces of Steve’s hiking boot, careful to keep the ankle straight. “That’s enough, Troy.” Ronnie glared at the arrogant man. “You’re supposed to be a professional. Knock it off so we can get him down to the ambulance. Help me pack up the equipment.” She stood up next to the Stokes. The cupped light-weight wire basket would allow them to carry Steve through the woods down to the parking lot where the ambulance waited. The team traded off in carrying him on the narrow trail a mile from the lot. Ronnie followed behind. The last thing she wanted was more time with Steve. She sighed heavily. He did need help. Great. Nearing the last quarter mile, Troy handed off to another man on the front of the basket. He turned and walked backward, ribbing Steve. His heel caught on a root, sending him to the ground. He landed in a pile of fresh horse dung. Question 1: Ronnie was too afraid to love a firefighter. Why? Answer 1: After her firefighter dad died in a fire, she couldn't take the chance to have to bear the pain again if she were to lose someone that way. Question 2: Is fear a logical answer to denying yourself love? Answer 2: No. We need to cherish the moments that take our breath away. Question 3: Could Steve had done anything different or should he have? Answer 3: Not if he wanted to protect others from the same fate as Frank. Question 4: What can guilt and dwelling on loss do to a person? Answer 4: Eat them up inside affecting the way you treat others. Question 5: How hard would it be for you to work with someone you had feelings for? Question 6: How could Debra forgive so easily? Answer 6: She didn't blame anyone else for what she got herself into. Question 7: Did Steve do the right thing by trying to force Ronnie to love Christmas again? Answer 7: Not necessarily, but he was fortunate it didn't backfire more. Question 8: Why was Troy so obnoxious? Answer 8: Trying to prove something to himself and others that he could do anything. Question 9: Have you ever had an epiphany moment like Ronnie had at the base of the rock wall? Question 10: When we allow God to do the healing, what results?